Greg Gerard holds his latest guitar at his shop in Homer. 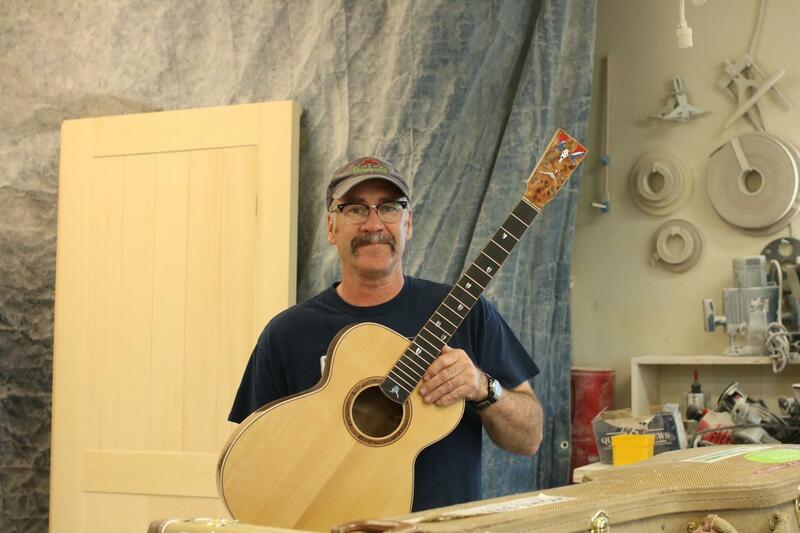 David Gerard is an aspiring guitar maker who passes his skills onto young students around Homer. Earlier this year, Gerard was one of three from the Homer area to receive project grants from the Rasmuson Foundation. This is the second time Gerard has won a Rasmuson grant, and he said this time, he wants to use that money to try his hand at building other stringed instruments. Gerard works in a shop below his house. His workspace looks like any other woodworking shop. There are tools lining the workbenches. Stacks of wood and other materials sit in the corner, and the smell of yellow cedar, Sitka spruce and other woods fill the air. “Counter tops and custom mill work. My brother made these actually, speaking of nice tone wood,” Gerard said as he pointed to a couple of unfinished doors in the corner. “That’s some old-growth yellow cedar from Southeast Alaska that was handpicked by the customer. None of that gets thrown away. Any scraps from this that are as small as a ukulele, I will save it, repurpose it into an instrument,” he explained. Other than a few guitar cases on one of the workstations, there aren’t many signs of guitar work, but that changes in the winter time. After a long workday, Gerard returns to his shop in the evening long after the sun has set or on weekends to slowly pick away at his next project. His affinity for guitar making started about seven years ago when he began performing in friends’ bands, and he decided he needed a professional guitar. A Martin dreadnought was his first choice, but with a retail price of about $3,000, Gerard said that just wasn’t in the cards for him at the time. “I just kind of had an idea. I had this great fully-outfitted woodworking shop and I have skills, maybe I’ll look into building one,” Gerard recalled. Over that winter, Gerard and a friend each built a guitar in his shop, following only the steps from a book on guitar making. Gerard built his Martin D28 dreadnought, complete with herringbone accents and a small herring skeleton on the headstock. After the first build, another friend approached Gerard about making a guitar and that annual tradition continued over the next couple of winters. Eventually, Gerard decided to pass on the skills he had learned. After his fourth build, he started taking on young guitar players from around Homer as students. Gerard works with a local teenager weekly each winter, and it can take two years to finish a build. Although Gerard has spent the majority his time building acoustic guitars and a few eclectics with his students, he has tried his hand at other instruments. He built his daughter a mandolin, and he’s also interested in learning to build other stringed instruments such as bouzoukis and citterns. Gerard said that will likely prevent him from taking on another student this winter, but he said whatever he chooses, whether its violins or mandolins, he hopes to eventually pass on those skills as well. The Rasmuson Foundation has awarded the Homer Public Library a $23,691 grant to buy books and materials. Library Director, Ann Dixon, who wrote the grant, says it was good news. “It was very good news because otherwise it was going to be looking very grim. There would be subscriptions to magazines and databases that we would have had to cancel and just a whole lot of books that we wouldn’t be able to buy,” said Dixon. Earlier this month, local artist and KBBI volunteer Desiree Hagen received an individual artist award from the Rasmuson Foundation. She plans to use the grant on a community art project making paper out of invasive plants in the Homer area. She hopes to both help remove the species from native plant areas and create awareness of their effects on the ecosystem. 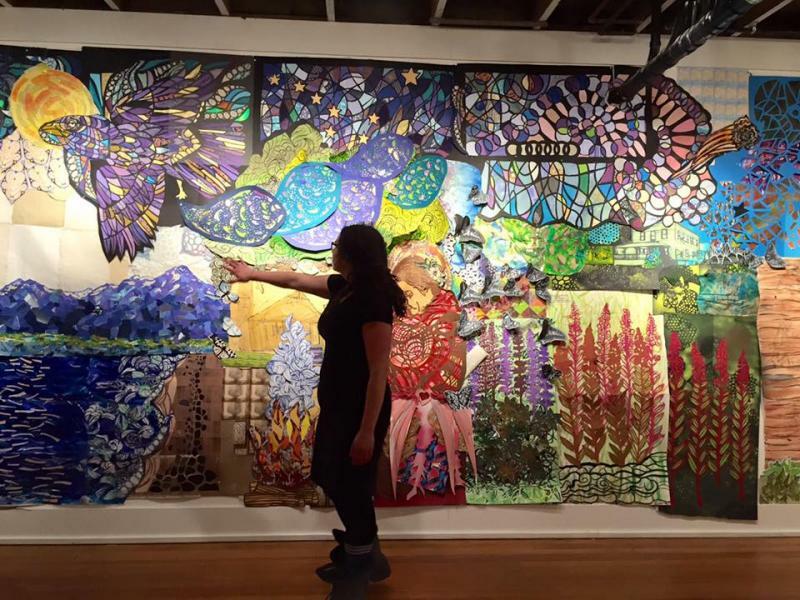 KBBI’s Shady Grove Oliver spoke with Hagen about her art. SGO: First of all, can you describe the scope of your project so people can have an idea of what you’re hoping to create with this?